It had been years since I visited the Yorkshire Sculpture Park, the open-air gallery on the grounds of Bretton Hall, home to artists like Henry Moore and Barbara Hepworth. I remember looking up at giant structures in pelting rain; Dad as always trying to elevate the moment, explaining the poignancy of certains curves and height while we were dying to get to the gift shop. I was thrilled then to return, this time to see Chiharu Shiota, whose most recent work Beyond Time opened in the Chapel on 30 March. With the sky a heavy grey, curdling in its own misery, and the rain soaking the park’s new lambs, I ran across the puddles, through the iron gate, past Ai Weiwei’s Iron Tree and into her world. Born in Japan but based in Berlin since 1996, Shiota rose to prominence in 2015 after representing Japan at the Venice Biennale and building a haunting web of crimson yarn and 50,000 metal keys that questioned ideas of space, time, mass and migration. In the Chapel, Shiota’s signature netting is used again, this time in white, the 2,000 balls of yarn crisscrossing until becoming an elaborate weightless maze, meeting the sides and ceiling of the building, blurring our sense of height and width, beginning and end. The Chapel is as much the installation as the net it holds. Painted white, its large windows coax light inside, seeming to invert that old expression: here the windows help our eyes see the soul of the exhibition. A metal wire piano stands in the middle of the room as if someone has penciled it into the scene. 1,500 sheets of archival paper including handwritten musical scores and covers from memorial services are weaved throughout the web. Unlike reports of past works, Beyond Time is not haunting or oppressive. I feel lifted as I enter, as I usually do in any chapel, but here the weightlessness of Shiota’s work invites you to breathe, to look up. It is as if she has frozen the papers in the air: thrown up in a moment of freedom, exaltation. But within the serenity Shiota brings forward her usual themes of memory and absence through colliding truths. In the Chapel, you step around the yarn, which – although close and tangible – is too fragile to touch. 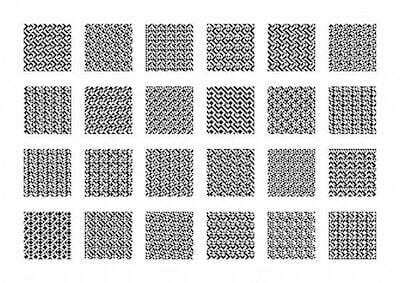 And – although otherworldly in its mass and complexity – the structure is, at the end of the day, string, and you can see this. You can see the staples in the walls where it is pinned and you can see the modern ink of the reprinted archival paper. Weight here is not placed on the original objects – be it the pews which have been removed, the organ or the sheet music – but in underlining their absence by recreating them as a present memory. 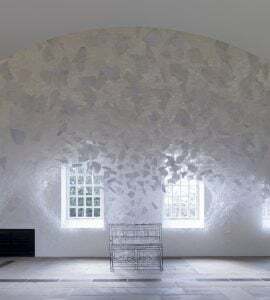 Interested in “tracing the life” of old objects, this is not Shiota’s first installation in a building of this kind, having showed Lost Worlds (2017) inside Berlin’s oldest church, St. Nikolai Kirche. She is not religious, but believes that religions are connected and make connections. 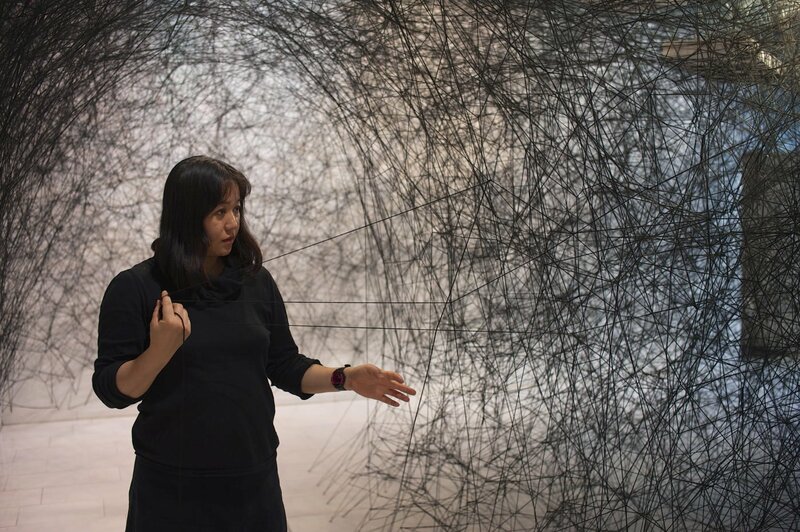 She has said that the nets and threads of her works represent these human interactions: “Some are intertwined with each other, and some cut off and get knotted again, going in a different direction.” Shiota used black in Lost Worlds for its universal quality “like a night sky”. So, what then, of her use of white? To my mind the black yarn’s twists and ties became more easily dense than the white. In photos there is a whispery spider-like quality to their shape; a jagged cloud, a still chaos, bruised almost by the memory it has been asked to evoke. White yarn suggests a shift. Having overcome cancer, a miscarriage and the death of her father in recent years perhaps Beyond Time is as much about Shiota’s relationship with her own memories as it is about the memories of the space itself. The piano, a recurring motif for Shiota, harks back to watching her neighbour’s house burn down as a child, from which a piano’s skeleton emerged. As she pays homage to the memory of the Chapel’s human past – the lives it has welcomed, guided and sent forward – the piano stands as a reminder of its silent absence and the absence of sound itself. Shiota’s string is the music here. I am totally alone in the Chapel, so much so that when I climb the stairs to sit in the upper pews becoming engrossed in the books of Shiota’s work that are laid out, the invigilator pads upstairs too, pretending to look at something on the wall, checking if I’m alright. Shiota’s web seems softer from the mezzanine. Merely there for a moment in time – “My work is always like this; after the show is over, it is cut and doesn’t exist physically anymore. Only in people’s memory.” – Shiota again reminds us of the contradiction of this space. The enduring dark oak pews are defiant in their stature next to her string; as her installation recalls memory, its transience recalls time. A student of Marina Abramović whose early work involved fasting, covering herself in toxic paint or sitting in muddy holes, Shiota has found her place with these giant structures. 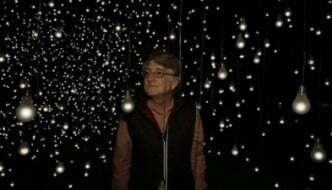 Beyond Time is well worth a visit; even on that dreary soup-like day Shiota provided a moment of clarity, buoyancy even. With the installation open throughout the summer I think I must revisit. I might even bring Dad this time.